CIB W78, Chile, July 15-17 2008 Building Informatics, Aalborg University Prof. Per Christiansson 1/11 Udviklingstendenser indenfor den digitale byggeproces. 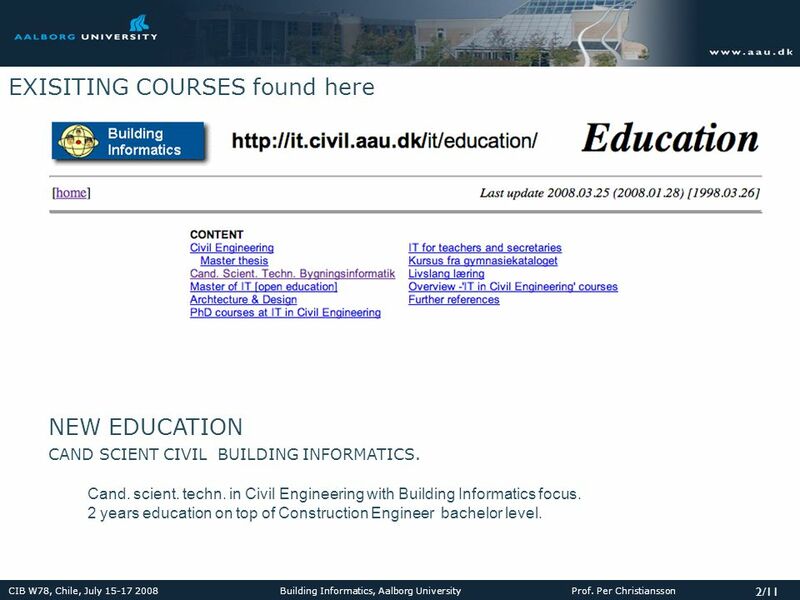 2 CIB W78, Chile, July 15-17 2008 Building Informatics, Aalborg University Prof. Per Christiansson 2/11 EXISITING COURSES found here NEW EDUCATION Cand. scient. techn. 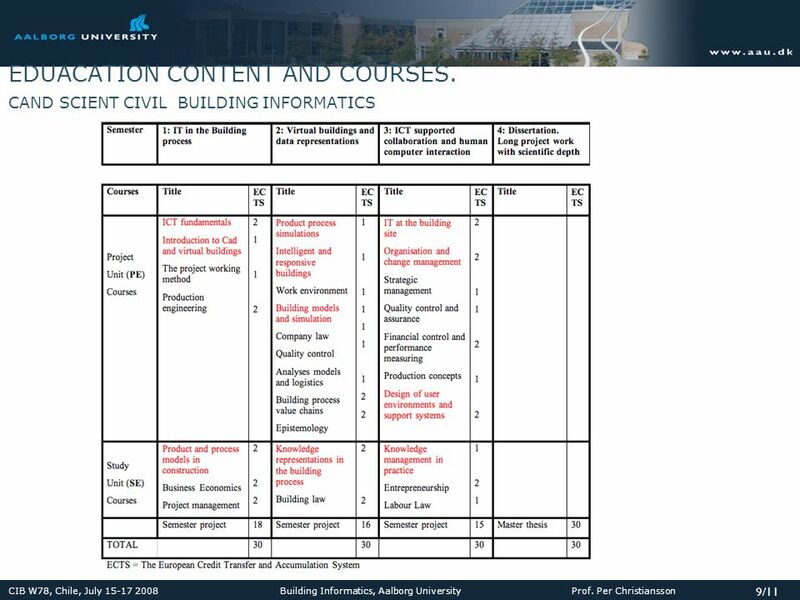 in Civil Engineering with Building Informatics focus. 2 years education on top of Construction Engineer bachelor level. 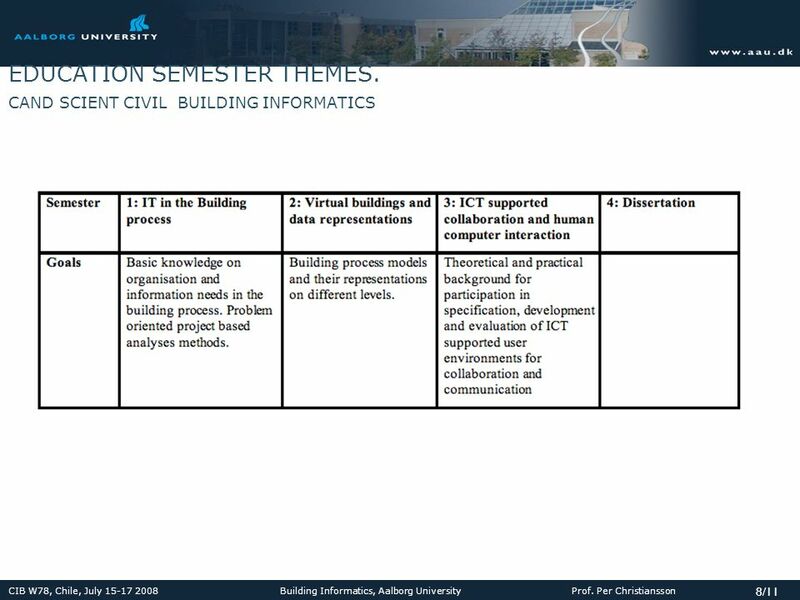 CAND SCIENT CIVIL BUILDING INFORMATICS. 3 CIB W78, Chile, July 15-17 2008 Building Informatics, Aalborg University Prof. 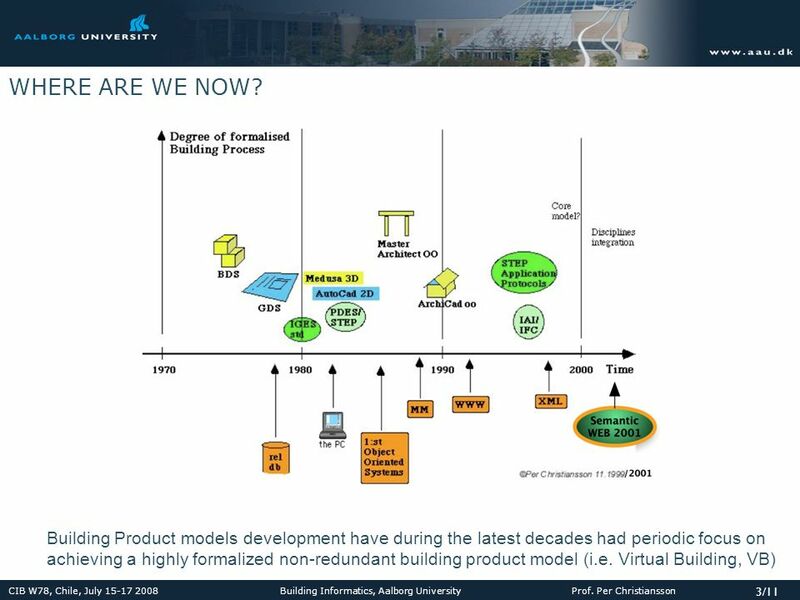 Per Christiansson 3/11 Building Product models development have during the latest decades had periodic focus on achieving a highly formalized non-redundant building product model (i.e. Virtual Building, VB) WHERE ARE WE NOW? 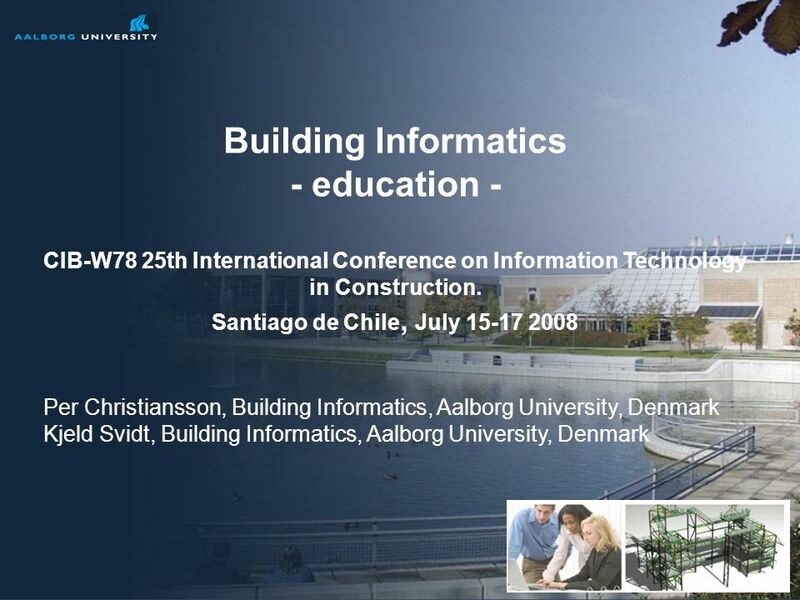 Download ppt "CIB W78, Chile, July 15-17 2008 Building Informatics, Aalborg University Prof. Per Christiansson 1/11 Udviklingstendenser indenfor den digitale byggeproces." Bygningskonsulentforeningen 9 oktober 2003 Prof. 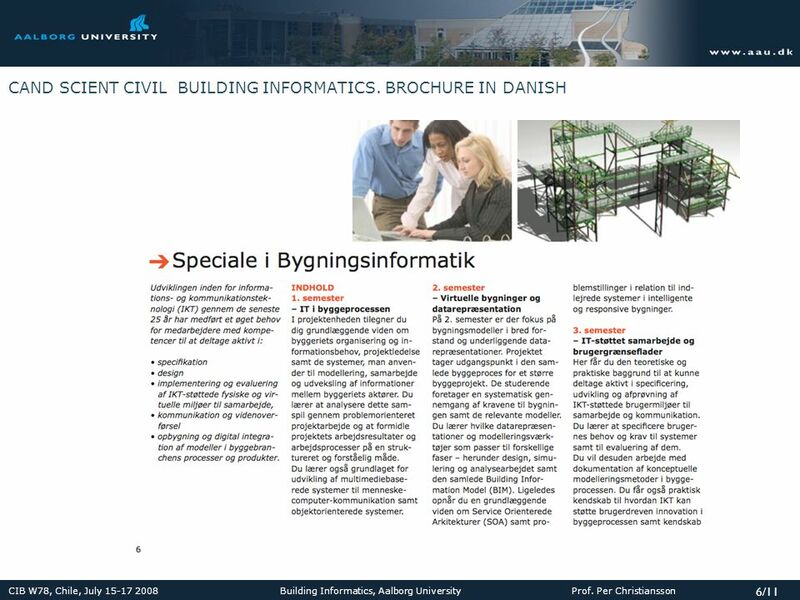 Per Christiansson  IT in Civil Engineering  Aalborg University 1/32 ICT Building. Virtual Reality projects at Department of Building technology Kjeld Svidt Aalborg University, AAU it.civil.auc.dk/ks Bygningskonsulentforeningens besøg. Frank Fitzek,Tatiana K. Madsen, and Patrick Seeling IP Header Compression Enabling High Quality Consumer-Oriented Communications Aalborg University, Denmark. 1. September, 2005Aalborg Universitet København, AUK 1 Welcome to AUK: Institute of Media Technology and Engineering Science (IMI, Institut for Medieteknologi. ERFA-Gruppen Det Digitale Byggeri. May Prof. 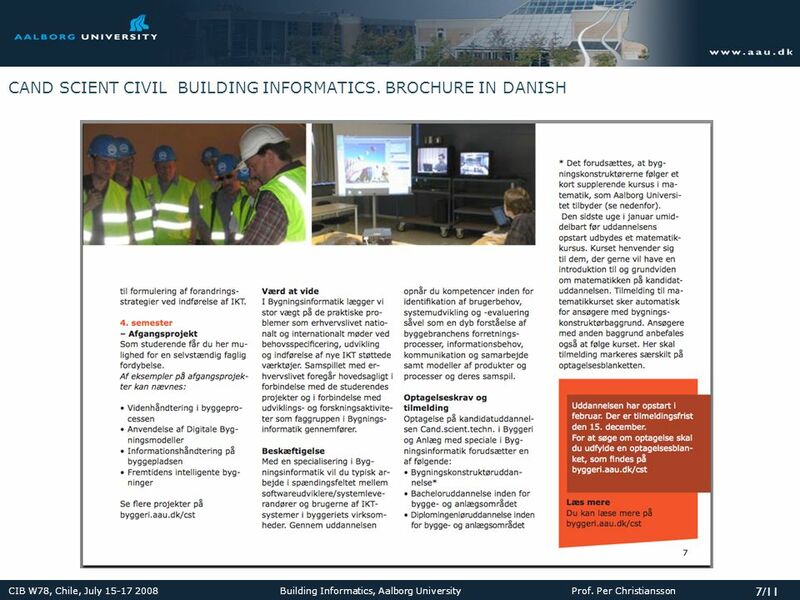 Per Christiansson  IT in Civil Engineering  Aalborg University ICT Building. W78 Dresden, July Prof. 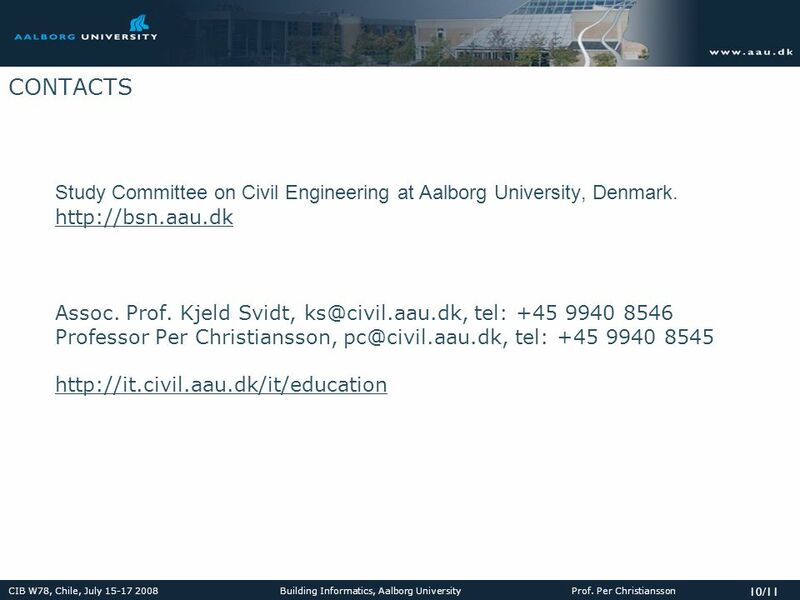 Per Christiansson, PhD Mads Carlsen  IT in Civil Engineering  Aalborg University [1/23] Virtual. IT-Byggenet Aalborg Prof. Per Christiansson  IT in Civil Engineering  Aalborg University Visioner om bygningsmodellers. Lärarkonferens Lund Prof. Per Christiansson  IT in Civil Engineering  Aalborg University 1/54 ICT I Dansk Högskoleutbildning. 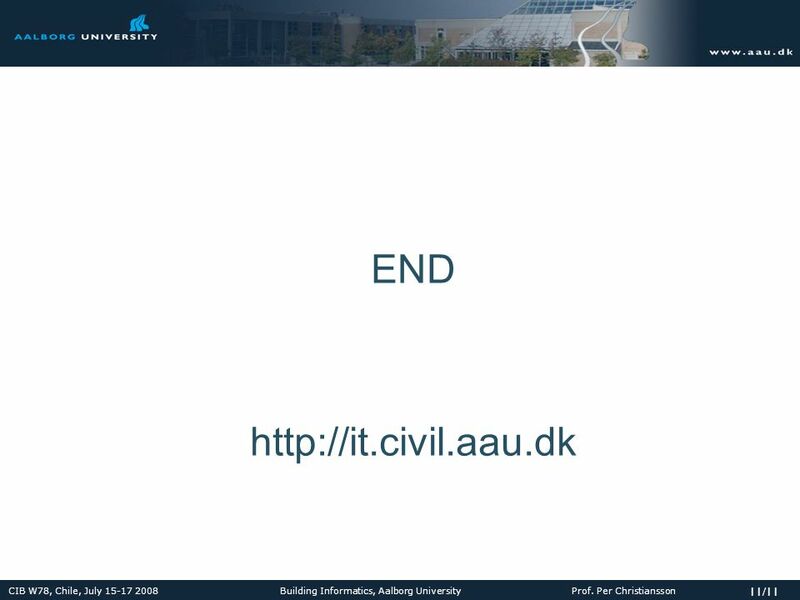 Livslang læring AAU Per Christiansson IT in Civil Engineering  Aalborg University [1/35] Den Digitale Byggeprocess Introduktion. 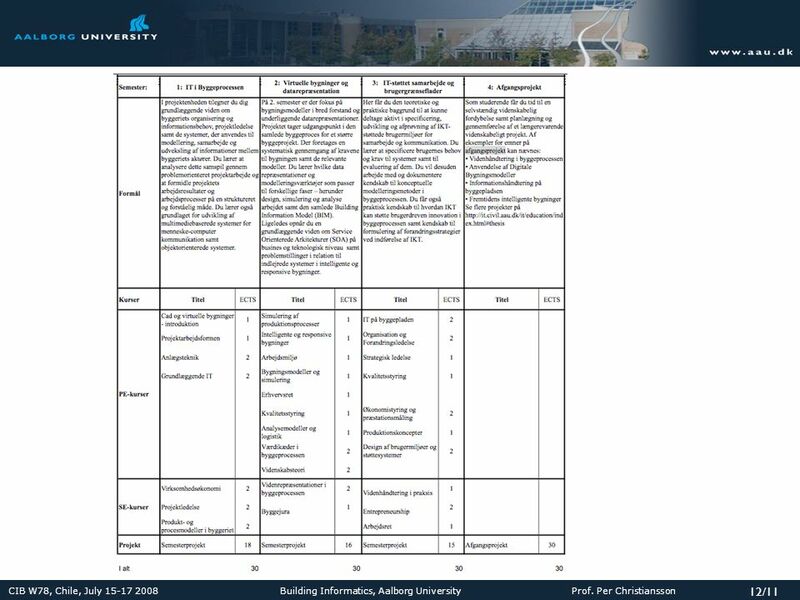 IKT kurser B AAU Per Christiansson IT in Civil Engineering  Aalborg University [1/17] ICT in the Building Process Education. Teknik&Data Odense Prof. 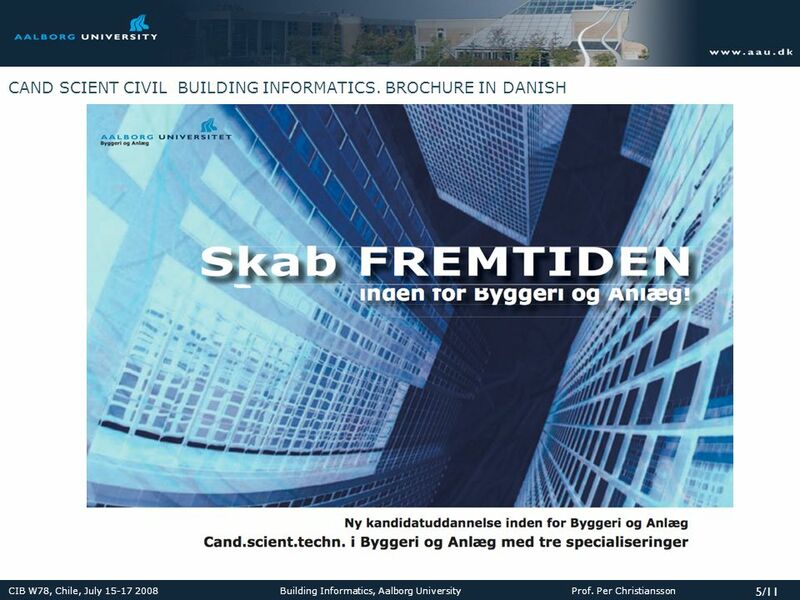 Per Christiansson  IT in Civil Engineering  Aalborg University Værdien af IT i Byggeriet Per. Byggenetværk Ebeltoft 21 oktober 2002 Prof. Per Christiansson  IT in Civil Engineering  Aalborg University Demonstration af visionen. 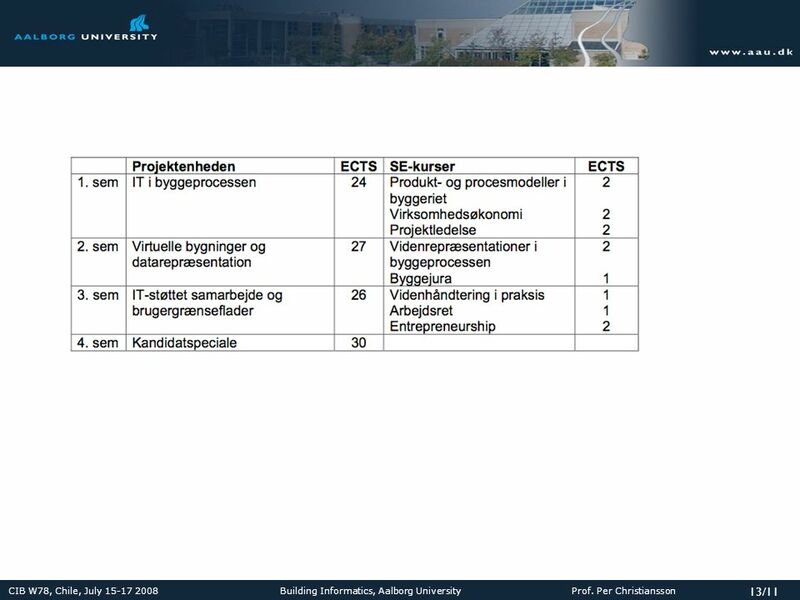 IKT kurser B AAU Per Christiansson IT in Civil Engineering  Aalborg University [1/24] ICT in the Building Process Education. Copyright © 2004 E-Learning Lab e-Learning Lab: Center for User centred Innovation, Learning and Design Department of Communication Aalborg University. 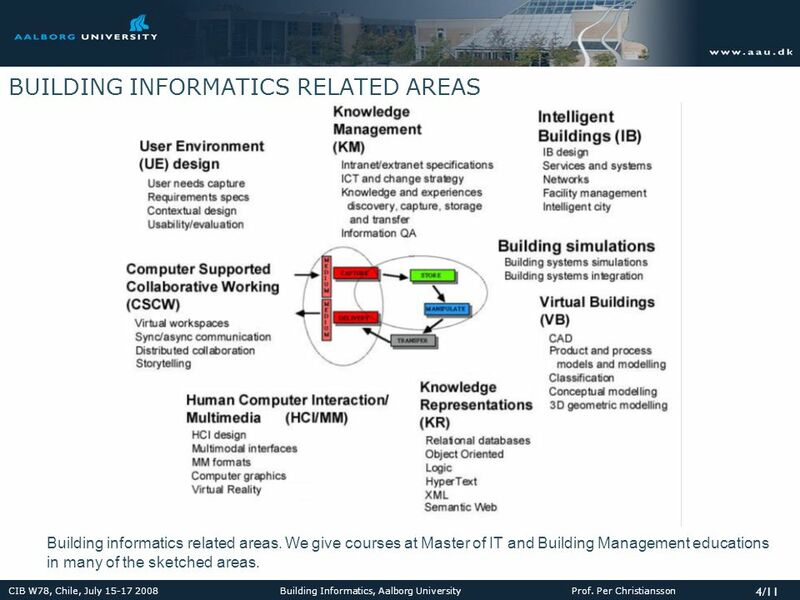 Per Christiansson, Building Informatics. Aalborg University. Livslang læring /52 Udviklingstendenser indenfor den digitale byggeproces. Per. DDB Datamodeller intern WS Per Christiansson AAU 1/8 Harmonisering af datamodeller Per Christiansson Aalborg Universitet Det Digitale. INSTITUTE FOR HEALTH SCIENCE AND TECHNOLOGY Invasion from Aalborg University. PROJECT SUMMARY Project Virtual Open-Access Network for Education and Training - Enhancing Interconnectivity between European and Asian Universities. KJELD SVIDT, AALBORG UNIVERSITY It.civil.auc.dk Initial studies on Virtual Reality Visualisation of 3D airflow in ventilated livestock buildings Kjeld. The Aalborg Model Problembased projectwork in teams.